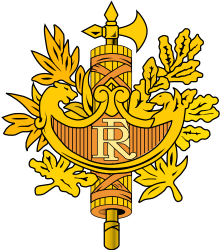 The political system of France consists of an executive branch, a legislative branch, and a judicial branch. Executive power is exercised by the President of the Republic and the Government. The Government consists of the Prime Minister and ministers. The Prime Minister is appointed by the President, and is responsible to Parliament. The government, including the Prime Minister, can be revoked by the National Assembly, the lower house of Parliament, through a "censure motion"; this ensures that the Prime Minister is always supported by a majority of the lower house (which, on most topics, has prominence over the upper house). 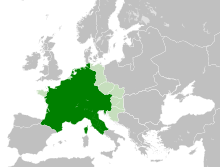 Gaul (Latin: Gallia) was a historical region of Western Europe during the Iron Age that was inhabited by Celtic tribes, encompassing present day France, Luxembourg, Belgium, most of Switzerland, parts of Northern Italy, as well as the parts of the Netherlands and Germany on the west bank of the Rhine. It covered an area of 494,000 km2 (191,000 sq mi). 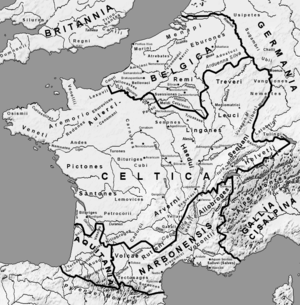 According to the testimony of Julius Caesar, Gaul was divided into three parts: Gallia Celtica, Belgica, and Aquitania. Archaeologically, the Gauls were bearers of the La Tène culture, which extended across all of Gaul, as well as east to Raetia, Noricum, Pannonia, and southwestern Germania during the 5th to 1st centuries BC. During the 2nd and 1st centuries BC, Gaul fell under Roman rule: Gallia Cisalpina was conquered in 203 BC and Gallia Narbonensis in 123 BC. Gaul was invaded after 120 BC by the Cimbri and the Teutons, who were in turn defeated by the Romans by 103 BC. Julius Caesar finally subdued the remaining parts of Gaul in his campaigns of 58 to 51 BC. Roman control of Gaul lasted for five centuries, until the last Roman rump state, the Domain of Soissons, fell to the Franks in AD 486. ... that when the O'Byrne-class submarines were seized by France before their sale to Romania, the Romanian Navy had to wait 15 more years to get its first submarine? ... that Antoinette Montaigne left her position as city councillor in France to become a minister in the government of the Central African Republic?